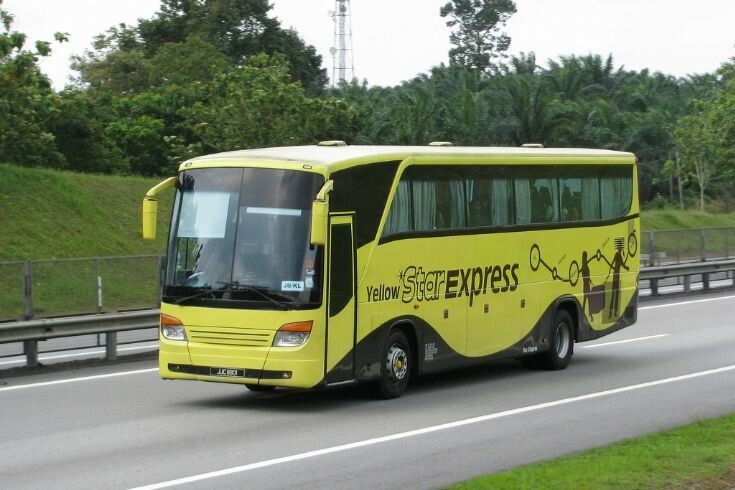 Yellow Star (JJC 8801) on the Johor Bahru - Kuala Lumpur run. Most certainly i've taken this before (fare RM60..not worth it ! ), it's Isuzu rear engine bus-chassis with very squeaky spring suspension. The transmission was very loud & vibrasive occasionally loud thuds felt on the floorboard by the gear hitting each other ! Supposed to be from KL to SGP but when reached Larkin, they switched over to another coach (from Meridian Holidays) probably as precaution..
Added by Chin on 29 November 2011. Interesting story - thanks Chin. I do know that sometimes the drivers 'trade' passengers to save going into Singapore if they really don't need to. I experienced this a couple if times. Added by Fazer9553 on 29 November 2011. Added by Naeila on 16 April 2012. Added by Jayaghanthen on 14 November 2016. This morning Bus to JB at 7.00am - we paid for the bus ticket and the seats, however, we were scolded by this bus follower for the rude service. Our friend could not come because of entering the hospital. We have a total of 9 seats, so 1 seat is empty (we put all the clothes in the seat, but this rude's bus follower yelled at my friend, now he sat down and slept our " Payment seat"
BUS PLATE ADY 2956 7am from TBS to Larkin. We have photo. Wish to hope the management can seriously look into this matter. Added by Kelvin Chan on 02 December 2018. Took bus from larkin to kl tbs. Not a trustworthy company. Advertise as express bus. Bus stops every half an hour at random stops at road sides to pick up random passenger. Drove off route so many times I lost count. Uses the word express to scam people. Just like all the other small time bus companies trying to earn more side money. What should have been a 4 hour ride turned into 6hours plus. Stick to kkkl, Transnasional, Causeway. Mayang sari if going from larkin to kl. These are the only companies that knows what express means. But tickets sells out very fast. Added by Cincalok on 14 March 2019. My name is Aly. Would you have any interest to have your website here at bus-and-coach-photos.com promoted as a resource on our blog alychidesign.com ? Added by Aly Chiman on 21 April 2019.